That’s a very important question! I’m so glad you asked. You know that one outfit you have that every time you put it on you seem to have a good day and get compliments? The combination you reach for when you know you’re meeting someone new or you have something amazing that you’re working on and are about to present or share. The outfit that makes you want to take selfies even when you’re not a selfie person. The outfit where the fit, color, and texture all work together to create joy? WEAR THAT. The very simple reason for this is that if you feel amazing—you’ll look amazing in your photographs. I have a bunch of photography tricks up my sleeve to make your images insanely flattering, but the thing one thing I can’t do is put the light in your eyes that says “I look like a million bucks and I know it.” Confidence and comfort are KEY for great authentic and beautiful expressions in your photographs, so let’s set ourselves up for success, shall we? You have a closet full of those kinds of outfits, you say? How could I possibly narrow it down, you say? But we need to MATCH you say? 1) Coordinate, but don’t match. Think about you and your partner (or your group if you’re taking family photos) as an entire color palette. The old standby of everyone wearing the same color top and bottom looks dated. (Think white polos and jeans on everyone in a 1998 awkward family photo shot at Olan Mills studio in the mall). You may love the combo of Navy, Bright red, and white, but you don’t all have to wear each color in the same way. That’s a sure way to look like your grandma bought you matching fourth of July jumpers. Imagine your outfits the way the camera sees them—all together as a group. Use your bright colors as accents on a couple people in the group but not everyone. 2) Match your level of formality instead—DO make sure it looks like you are all dressed for the same occasion—much more than colors, a single pair of sneakers in a lineup of dress shoes, or one person in formal wear while everyone else wears jeans—can make a photo look “off.” If it’s hard to tell if something fits the occasion, get dressed in your proposed ensemble, stand in front of the mirror, and decide what kind of event your clothes would get you into. Black tie dinner? Backyard BBQ? There is no need to look like you shopped at the same store or to match cummerbunds with exact dress satin a-la choosing bridesmaid and groomsmen attire, just make sure you’re all going to the same party. 4) Think Big Picture: Imagine these portraits on your facebook wall next week AND on your actual wall in 20 years. Is what you’re wearing overly trendy? Don’t worry about your hairstyle and jeans because styles will always change—but are you taking an especially daring and “right now” fashion choice? Looking back, do you feel like it might be the style equivalent of puffy sleeves and teased hair on your favorite aunt’s wedding dress in 1989? It’s fine if it is, I just want you to be prepared. Photos are forever. 5) Bring options. If you’ve stood in front of the mirror and agonized and you’re still not sure, I am more than happy to help you narrow it down. Throw a few extra shirts in the car and I’ll help you think through it when I see you and your partner or group in the setting. Scarves, cardigans, extra shoes, and changes of jewelry can all add a pop of color or dress up or dress down an outfit in the moment without even finding a changing room. EXTRA CREDIT: Vary your textures. Pairing a tweed jacket with a silk shirt or a chunky knit scarf with a fitted top is a great way to make your photos look rich and alive. PRO TIP: If one person has a strong opinion about their own outfit (Usually the bride or mom) everyone else should follow that person’s lead for colors and style. Usually when coordinating, someone has to compromise—just make sure it’s the right person. Ready to book your portrait session? CLICK HERE to get started. 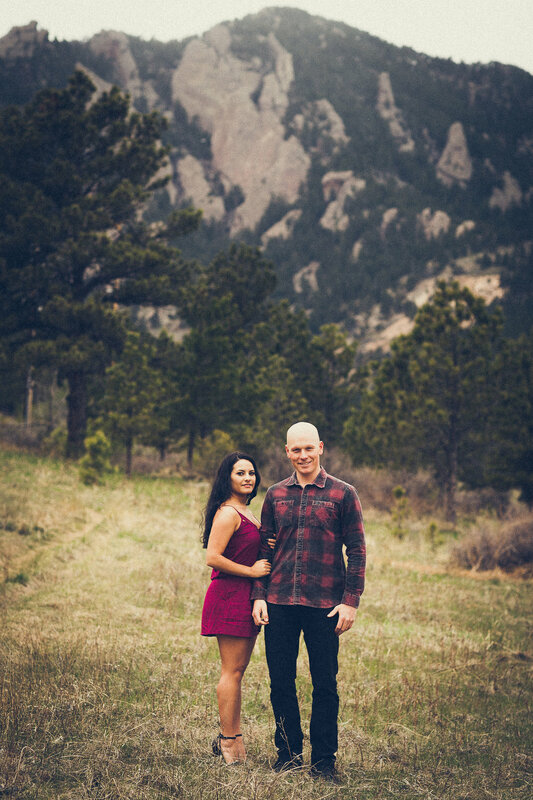 Shooting in Colorado is ALWAYS a great idea, and I am available in the Denver area most weeks. Looking for a shoot where you live? I’ll be in Houston, Austin, Boston, Seattle, and Tulsa this summer. Get in touch!